Shelters, Shacks, and Shanties is a lively, step-by-step guide to building all types of temporary and long-term accommodations from both natural and man-made materials. This practical classic is as essential a guide for today's modern homesteader as it was at the turn of the century. 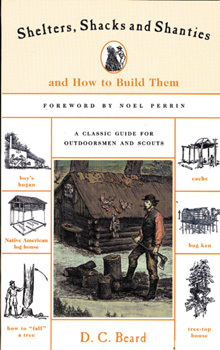 It contains thoroughly explained instructions for dozens of worry-free shelters - sod house for the lawn, treetop house for the kids, over-water camps, bog ken, and many more. Satisfying the builders need for the creature comforts of home, tips on how to build hearths and chimneys, notched log ladders, and locks for the front door are included. Fully illustrated with hundreds of helpful drawings, this book is a throw-back to the can-do spirit of the American frontier that proves both a nostalgic glimpse into the past and a useful guide.